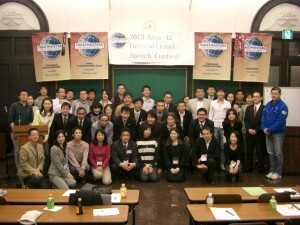 Area42 spring contest was held at Kaiko Kinen Kaikan on Mar. 16th. 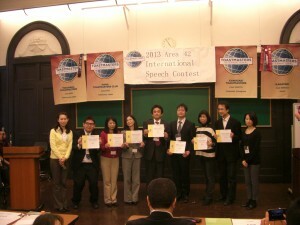 Then we were host club, and TM H.A was contest chair in this contest. Many YTMC members and some other club members helped in order for the success of this contest. So it became very nice contest!! 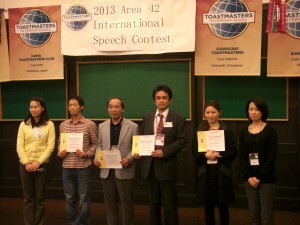 In addition, TM T.Y, TM T.M, and TM R.K joined Area42 contest as a contestant. 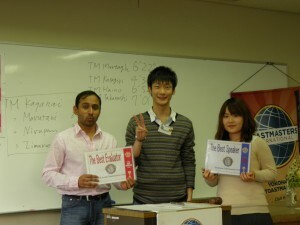 TM T.Y joined international contest, TM R.K joined Japanese contest, and TM T.M joined both. I think they could take the best performance in each other!! As a result, TM T.M was second place winner, and go to the next contest, Division D contest! Div D contest will be held on Apr 21th. Let’s go there to this contest and cheer for him together. The 545th YTMC meeting was held at Kannai on Mar.2nd. 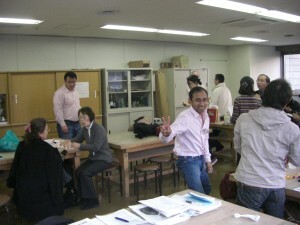 The venue of the meeting was artifice room of Gino-Bunka-Kaikan. It was quite different from usual, but I thought it’s OK sometimes!! In this meeting, TM T.Y took presentation of YTMC 25th anniversary within 15min. We will hold 25th anniversary event on Jun.1st, and he is steering committee chair of this event. He explained YTMC members in detail about this event. Some members asked questions. And TM N.G is making the DVD for 25th anniversary, and he showed a video picture to YTMC members in this presentation. It is halfway yet, but very nice video picture!!! I can’t wait to be completed!!! And today, there were four speakers. One of them was a male, the others were females. Then I recalled tomorrow is Hina-Matsuri which is girl’s festival in Japan, and I thought today’s prepared speech session is Ohina-sama version!! One Odairi-sama, and three Ohina-sama! And…TM M.K won the award for the prepared speech session!! Congratulation!!! 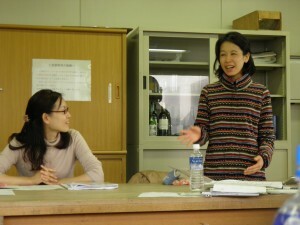 She is the youngest member in YTMC. I’m looking forward to her future progress!! On Mar.16th, Area 42 contest is scheduled. YTMC is a host club for this contest. And TM T.Y and TM T.M will join it as a contestant. So let’s provide the best contest together, and let’s cheer for two contestants!!! If you want to see more photos, please click here! !